Looking for a natural, healthy way to give your lips the color and plumpness you've been searching for? Look no further than Cowgirl Dirt's Yeehaw Lipstick. With multiple color options and finishes, there is a Yeehaw Lipstick shade for everyone's saddle bag. Our lightly citrus flavored lipsticks are formulated to soothe and deeply hydrate your lips while adding the perfect color to finish out your cowgirl look. To complete your look with even deeper hydration and shine, start with a coat of High Noon Lip Moisturizer under your lipstick color of choice and add the shine of a Bodacious Botanical Lip Gloss on top. Sample Size good for 1-3 uses. Unhappy with sample of lipstick expected tiny tube but just a smudge not even to cover my lips. You should be enbearess to send this out to a customer. When I got my sample, I could not use it. it was dry and wouldn't even make a mark on my finger. Very disappointed. I only purchased sample sizes of the lipsticks. They don't work for me. There is nothing wrong with the formula and they wear well. They are too metallic looking on me and just not my style. I don't want to give them less stars because as a lipstick goes they feel nice and wear well. The finish just isn't for me. I ordered the sample. I realize it was just a sample but I still paid for it and I think samples need to be a little bigger. I paid $1 for maybe a penny worth of product that I couldn't even use. It was so hard and dried out that I couldn't even put it on. It was like putting on little balls of wax. I ordered lots of samples and all were way too small for the sample prices. If they don't want to send you a full sample when you paid for a full sample, why would they give you the full amount for the larger sizes that you pay more for? Really disappointed and I won't order from this company again. I have fair skin. The Cash color worked well for me. The consistency is smooth, moisturizing, nice scent and not heavy. Very happy! After learning about Cowgirl Dirt, I was excited to try their products--especially because they offer samples of their cosmetics. (I'm tired of trying to pick a shade in the store, only to come home and find that it looks very different on--I've wasted money that way!) So, I ordered samples of Secretariat and War Admiral (and Trigger). Secretariat was a brighter red than I expected (though it would look lovely on someone else) but War Admiral was PERFECT. It's what I've been looking for, for years! This lipstick is not pasty-feeling, and it doesn't make my lips feel dried out. It is smooth and rich and moisturizing. I love that the ingredients are natural, and I can tell that there is a difference between this lovely natural product versus other store brands!! 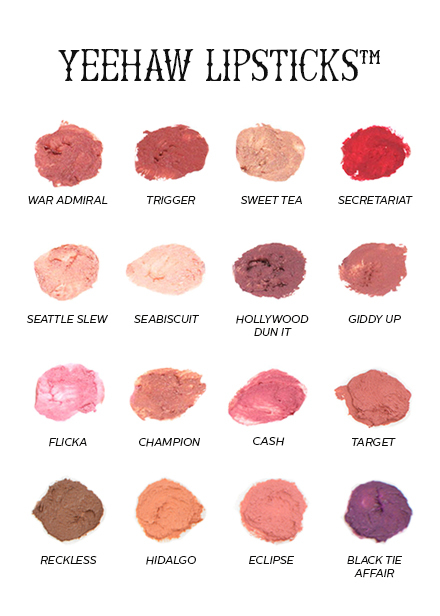 I also liked the Trigger shade, and I certainly plan to continue buying my lipsticks from Cowgirl Dirt. I love it! The best quality lipstick I have ever used. It went on very smoothly. A little went a long way and lasted much longer than most lipsticks. I really like these lipsticks. They're like, halfway between a gloss and a lipstick, which I LOVE. I've tried Secretariat, Seattle Slew and Flicka and my favorite by far is Flicka. 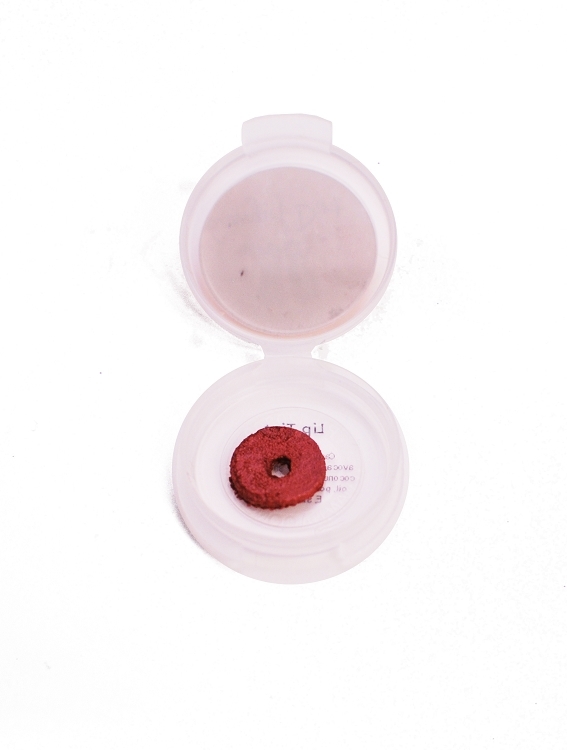 It is a super sweet medium pink/berry color with a light shimmer and is super pretty as a neutral, go-to lipcolor. Seattle Slew was too peachy with a whitish shimmer that wasn't for me. Secretariat is a fantastic cool red for those of us who aren't quite down with a heavy matte red lipstick. It feels good going on and is a captivating color. I really like how these look and feel. FYI, I have fair-to-olive complexion. I really liked these! Very creamy and beautiful colors! 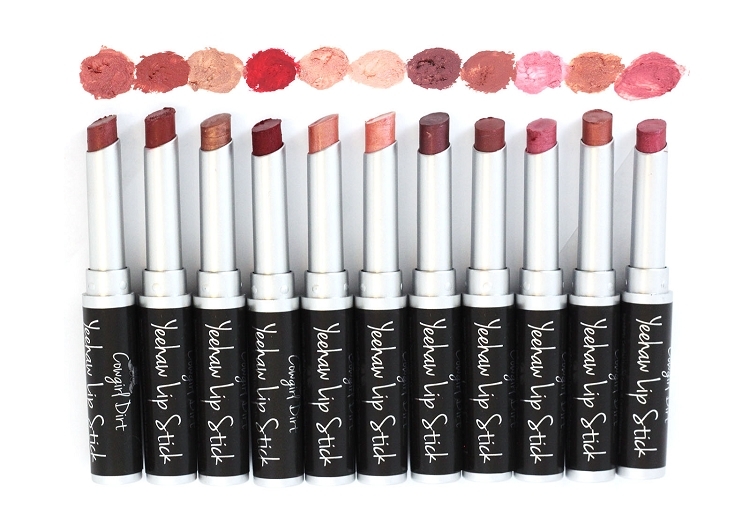 Our uniquely formulated Yeehaw Lipstick will do more than provide you with a good look, it will also bring your lips many nutritious benefits. Certified Organic Beeswax: This organic hydrating ingredient helps to increase and lock in your lip's moisture. Certified Organic Pomegranate Oil: This oil is jammed packed with antioxidants to help nourish and rejuvenate skin cells. Stevia Leaf Extract: This natural sweetener derived from this leaf leaves your lips with a sweet taste. Non-GMO Natural Vitamin E Oil: This oil supplies your lips directly with antioxidants, protects the epidermis, and combats against free radicals. Certified Organic Ricinus Communis (Castor) Oil, Certified Organic Cera Alba (Beeswax), Olive Emulsifiers, Persea gratissima (Avocado) Butter, Certified Organic Butyrospermum Parkii (Shea Butter), Certified Organic Cocos Nucifera (Coconut) Oil, Certified Organic Olea Europaea (Olive Oil), Certified Organic Simmondsia Chinensis (Jojoba Oil), Certified Organic Punica Granatum (Pomegranate) Oil, Non-GMO Natural Vitamin E, Stevia Rebaudiana (Stevia) Leaf Extract. (May contain 100% Natural Fruit Extracts or Essential Oils of Raspberry, Pomegranate, Sweet Orange & Lime, Iron Oxides, Mica, Zinc Oxide, Carmine, or Manganese Violet). *Note: The Secretariat and Cash shades contain Carmine for a portion of their natural coloring. While most lipstick color choices have to do with preference, some guidelines will help you know which colors are sure to look great with your complexion. First, you need to know what tone your skin is--cool, warm, or neutral. Warm tones: base coloring of orange and yellow. 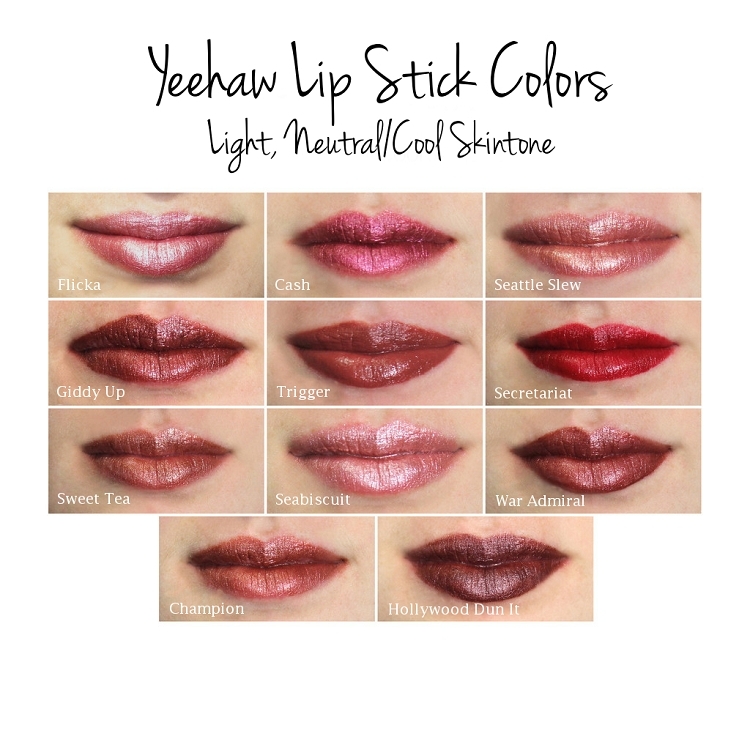 Cowgirl Dirt's Yeehaw Lipstick come in matte and gloss finishes.